Let your team fly and win all the challenges with this awesome cap. It has a unique eye-catching design of a wing on the side, that is sure to inspire them to greater heights. The cap has a classic structured 6-panel design with a pre-curved peak. It is made from a cotton twill which is a woven fabric. Soiling and stains are less noticeable on woven fabrics and they are also more durable than non-woven fabrics. All our caps are made to the highest standards using only the best quality materials. Seams are double stitched for strength and long life. 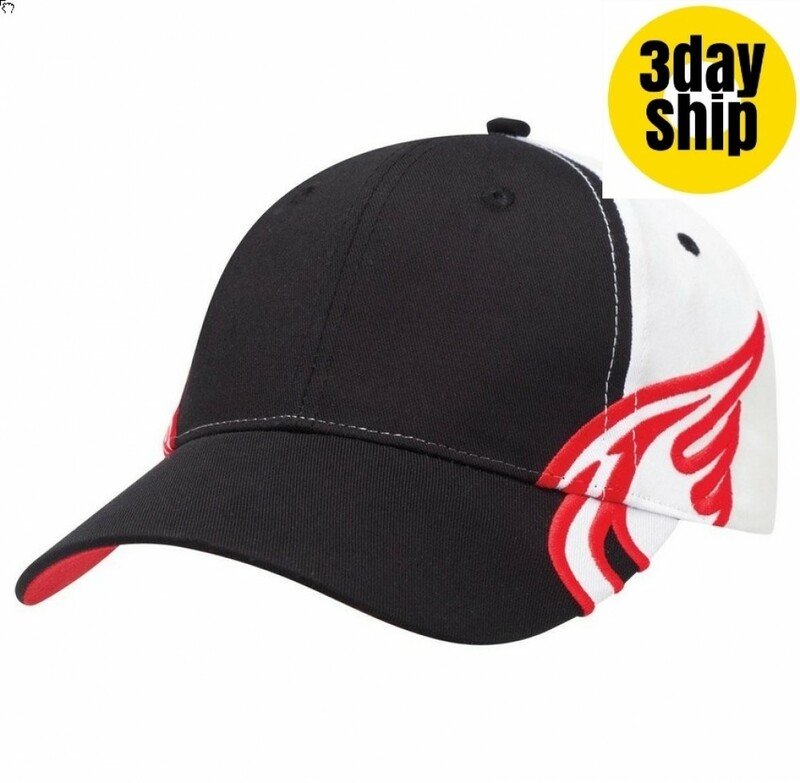 This cap features a striking wing design on the side in a colour that matches the trim under the peak. You are sure to find the perfect colour fit for your team's emblem or company logo. These winged caps are sure to help your brand to take flight. They're not only great for sporting teams and social clubs, they make great promotional sales items for fundraising or giveaways at conferences and trade shows. Our pricing includes 8k stitches of embroidery on your graphic. Choose to place your logo on the peak, sides or back of the cap. Embroidery can accommodate the multiple colours of your logo and graphics. A set up of $50 applies for orders under 50 units. Delivery within Australia only. Pricing excludes GST. We deliver to all States and Territories of Australia -- TAS | VIC | WA | SA | NSW | ACT | QLD | NT. We deliver to all areas, city and country. We are not currently able to deliver outside of Australia. Ask our friendly sales staff for details about multiple, bulk or rush orders.